Weekend Wrap: 3D headphones, vinyl speaker, 4K streaming box and more | What Hi-Fi? From the news that Xiaomi has produced a media streaming box that supports 4K Ultra HD, to Netflix introducing its own internet speed testing tool and 3D Sound Labs releasing a module that brings 3D sound to your own headphones - it's What Hi-Fi? 's Weekend Wrap. 3D Sound Labs, makers of the 3D Sound One headphones, has produced a module that claims to bring an immersive 3D sound to your current headphones. 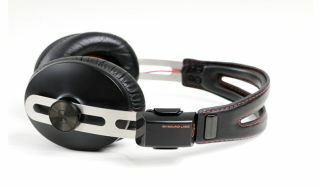 The 3D Sound One Module attaches to the headband of your headphones and connects to them via Bluetooth to a smartphone or computer. The Module's built-in movement sensors are said to “deliver a multipoint sound, similar to last generation cinema halls and sophisticated home cinema equipment”. For a demo of 3D sound, visit the 3D Sound One website, where you can also pre-order the Module for £79. If you love the distinct warm sound created by vinyl records and want a similar sound from your iPhone, then the Louis speaker may be of interest. Designed by Italian Paolo Cappello, it's a wooden speaker that mimics the sound you’d normally associate with vinyl. There are no electronic components, simply place your iPhone in the slot at the top of the speaker and the companion app “creates a dialogue” between the phone’s sensors and the shape of the speaker to “elevate the sound quality”. It’s hard to say whether it does accurately recreate the sound of vinyl, but the Louis is available now in natural, yellow or anthracite finishes for €149. Chinese electronics manufacturer Xiaomi has announced an updated version of its Mi Box media streamer, following a partnership with Google. The new model will support 4K Ultra HD TV and HDR, although it is currently only available in the USA. Xiaomi also produces Full HD versions of the Mi Box, which are available outside the US. The 4K Mi Box comes bundled with a Bluetooth remote control, voice recognition and Google Cast built-in, which allows you to stream music, movies and apps from compatible apps. Price and release date details for the 4K Mi Box have yet to be confirmed. Noble Audio has announced three new material options for its flagship range of Prestige in-ear monitors: Pablo, Pinecone and Space Zebra. Pablo (top left) takes design inspiration from Pablo Picasso, the Pinecone (top right) finish sees tiny pinecones cast in a variety of colours and Space Zebra (main pic) is made up of 'thousands' of layers of knitted material, cut and combined at angles. These material options for the Kaiser 10 Prestige and Savant Prestige are available now. Prices are as follows: Kaiser 10 Prestige Pinecone, £1870; Space Zebra, £1940; Pablo, £2010. Savant Prestige Pinecone, £1185; Space Zebra, £1255; Pablo, £1325. MORE: Noble Audio Prestige claimed to be "the world's most luxurious in-ear monitors". When we reviewed the Humax FVP-4000T Freeview Play box earlier this year, one of the few criticisms we levelled against it was the lack of Netflix. Humax has now rectified that issue with the announcement that the streaming service will now be available via a free software update. The FVP-4000T has three built-in HD tuners, allowing you to record four programmes while watching a fifth, and comes in 500GB and 1TB storage models. More news from Netflix, as the streaming service has introduced a new internet speed check tool. Accessible from either mobile devices or computers, it measures the current speed of broadband or cellular data. Fast.com uses Netflix servers and is available to anyone, regardless of whether they have a Netflix subscription or not. It claims to provide similar results to other tools such as speedtest.net. Check the speed of your internet using fast.com here.